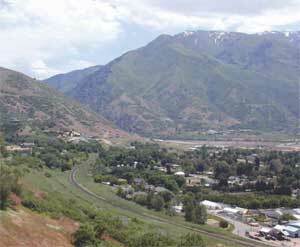 View looking east to mouth of Weber Canyon. Aquifer storage and recovery site at middle right margin of photo. Artificial ground-water recharge has long been recognized as a means of introducing water into the groundwater system to store water, reduce pumping lifts, salvage storm-water runoff, or enhance ground-water quality. Basically, ground-water aquifers (saturated rock or sediment that yield water in economic quantities to wells or springs) are used as water-storage facilities instead of constructing surface-water reservoirs. Artificial ground-water recharge can be accomplished by surface spreading or ponding of water in areas where surficial deposits are highly permeable, or by injection of surface water into an aquifer using wells. Interest in artificial groundwater recharge has increased in recent years due to declining water levels in many aquifer systems around the world, including Utah. Aquifer storage and recovery projects involve the storage of water in an aquifer via artificial ground-water recharge when water is available (usually during spring runoff), and recovery of the stored water from the aquifer when water is needed (usually late summer). Although losses of water stored via artificial groundwater recharge do occur, principally by water moving vertically or laterally out of the target aquifer before recovery, the sometimes significant losses of water through evaporation from surface-water storage facilities are largely avoided. The most important ground-water resources in the Ogden area occur in unconsolidated to semi-consolidated Quaternary basin-fill deposits. These deposits consist of overall coarser grained alluvial-fan and stream- channel sediments near the mountain front, and overall finer grained lake and stream sediments westward away from the mountains. Two principal aquifers, the Sunset and Delta, have been delineated in the Ogden area. The Delta aquifer is the primary source of ground water in the Ogden area, and is composed mostly of coarsegrained, Tertiary-age stream and delta sediments. The top of the Delta aquifer is 500-700 feet below the ground surface in the Ogden area, and the aquifer is about 50-200 feet thick. The shallower Sunset aquifer has a lower permeability and is used to a lesser extent as a source of ground water. Fine-grained confining intervals overlie both aquifers away from the mountain front. However, these confining intervals are absent in a narrow band along the mountain front; this area where the confining layers are absent is called a recharge area. The recharge area in the Ogden area is widest at the mouth of Weber Canyon; most of the recharge to both the Delta and Sunset aquifers is from the Weber River in this ground-water recharge area. Ground-water levels in the Ogden area have declined since 1953, probably related to increased withdrawals from wells for municipal and industrial use. 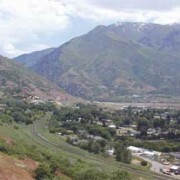 From 1953 to 1985, water levels declined an average of 27 feet in the Ogden area, with a maximum drop of 50 feet in the vicinity of Hill Air Force Base, Sunset, and Clearfield. Water levels in wells in the recharge area near the mouth of Weber Canyon declined as much as 40 feet during the same time period. The trend in declining water levels does not appear to have slowed; water-level declines of up to 30.8 feet were documented by the U.S. Geological Survey from 1970 to 2000. This overdraft of the aquifer has not only increased pumping lifts and hence operational costs, but could also initiate land subsidence or salt water intrusion from Great Salt Lake. Aquifer storage and recovery within the Delta aquifer, either via land-surface infiltration or injection wells, offers a potential solution to the problems associated with the water-level decline in the Ogden area. During the 1950s, the U.S. Bureau of Reclamation conducted a series of on-site aquifer recharge experiments in the gravel pits at the mouth of Weber Canyon. Each of the experiments resulted in an increase in water levels in observation wells, and the experiments were deemed successful by Utah Water Research Laboratory investigators who reviewed the data in the 1980s. Now personnel from the U.S. Bureau of Reclamation, Weber Basin Water Conservancy District, Utah Division of Water Resources, Weber State University Department of Geosciences, and Utah Geological Survey are engaged in designing an initial pilot project at the mouth of Weber Canyon to determine the feasibility of full-scale aquifer storage and recovery in the Delta aquifer. During the initial phases of the project, personnel from these agencies are collecting water-level and water-quality data. These data will be used to provide a benchmark for measuring the success of the project after artificial recharge is initiated, likely through diversion of the Weber River into gravel pits or specially constructed ponding areas sometime between April and June 2004. The UGS is participating in the interpretation of water-quality data, water-level data (collected through a microgravity survey as well as measuring water levels in wells) and in writing the final report which will likely be published by the UGS. It is hoped that this project will not only provide a means of stabilizing water levels in wells completed in the Delta aquifer, but that it will also provide water planners and managers with increased flexibility in managing and perhaps increasing ground-water resources.